The Ratilanna Resort Spa Hotel lawns were transformed with white and gold ‘Winter Dreams’ recently as the theme for Chiang Mai’s latest charity party. The event, staged November 29, was held in aid of the Education Children’s Fund Development (ECFD), a new and independent group working to support grandparents who are caring for their orphaned grandchildren. There are 70 such families at present under the care of the ECFD, which is chaired by Hope Watcharaprecha, with Margaret Bhudungzong, its international secretary, responsible for fundraising activities. The ‘Winter Dreams Charity Party’ was the organisation’s first fundraiser – and with over 100 tickets sold it was a great success. The secretary to the chief executive of Chiang Mai’s Provincial Administrative Organisation, Wiphawan Woraphutiphong, graciously opened the festivities. 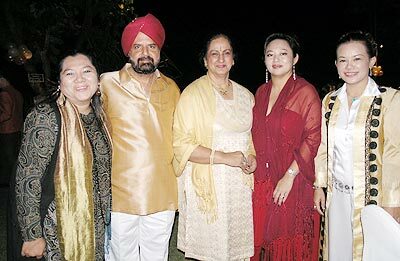 Many elegant ladies and couples took the ‘White and Gold’ theme to heart and arrived dressed in their glamorous best - all ready to try for the prize in the ‘Best looking and Beautiful Couple’ competition. Everyone enjoyed and danced to the live music; a ‘Wheel of Fortune’ and a silent auction with donated prizes completed the evening’s entertainment. For further information on ECFD, or to contact them, please visit their website at www.grandmacares.com. Guests at the party were all elegantly dressed for the occasion. Jo & Sally, two of the Garden Party’s organisers, with Frank and the monks from the temple enjoy a great day at the event. Citylife opened its gardens on the last day of November for their 3rd ‘Garden Party’, held in aid of the Charity Rooftop Party. The event was the biggest so far, with more stalls, more visitors and more money raised than ever before. Plenty to buy, eat, drink and be merry, The Chedi was there, selling chocolate bars and donated all the money from their sales to the fund. Together with the generous donations from others such as Tananan Willson, Chat from the House, Bon Café, HQ Paper, Dukes and many more, a grand total of 50,000 baht was raised. Music was provided by the kids from School for the Blind; one of the main charities who will benefit from this year’s Rooftop fund after the party itself on January 10, 2009. However, the above is only half the story, with 6 other charities and foundations who, given free tables, successfully raised money for their own worthwhile causes. Almost all the clothes and household items donated for the ever-popular bric-a-brac stall were sold, with those remaining at the end of the day given to a local temple who will deliver them to Hill Tribes people in the province. A ‘Win-Win-Win’ situation! The Garden Party was also the first chance for people to buy their tickets for the 5th Annual Charity Rooftop Party on January 10 at Hillside Plaza and Condotel 4. Tickets cost 800 baht, and include two complimentary drinks, an international buffet plus the chance to win a special prize. There will be live entertainment, raffles and live and silent auctions. Tickets can be bought at Hillside 4 reception, and also at the Nimmanhaemindha Art and Design Promenade from December 5 until 9.
presides over the opening ceremony of the Ruen Raya Resort. 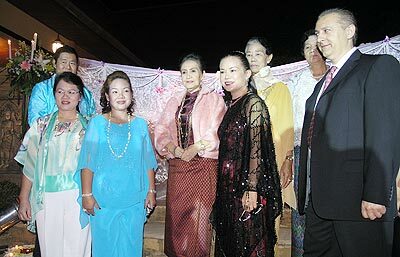 Over 80 foreign and Thai residents of Chiang Mai joined the owner, Raya Luelai on November 28 to celebrate and take a quick peek at one of the smartest new boutique resorts in the city area. The Ruen Raya Resort Residence’s grand opening ceremony was performed by Dr. Chao Duangduan na Chiengmai, after which guests received a taste of the fine design and beautiful surroundings which will be on offer. The resort, located just off the Mae Rim-Samoeng Road, began life as a private home and has been redesigned and transformed with loving care by Raya, using traditional and local construction materials, into a very elegant place to stay. The central Thailand decorative theme of the lovely ‘Ayudthaya Suite’, and the luxurious comfort of the ‘Grand Royal Mae Rim Suite’, are sure to delight visitors as much as the glorious green of the gardens. Raya herself is famous locally for her culinary skills - a great reputation precedes this young lady and her beautiful resort and we wish her well. 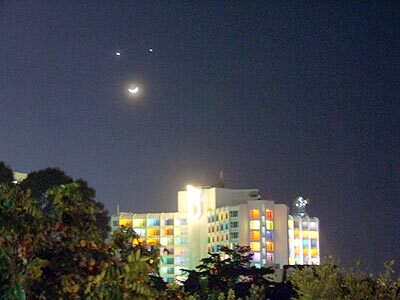 For more details, please visit the resort’s website, www.ruenraya.com. Dr. Paritat Silpakit M.D., M.B.A. and Dr. Kittiwan Thiamkaew M.D from Chiang Mai’s Suan Prung Psychiatric Hospital were kind enough to agree to an interview with the CM Mail. We had many questions for them that were answered with both candour and concern by the two doctors. Here is a transcript of the interview. Dr. Paritat Silpakit M.D., M.B.A., with Dr. Kittiwan Thiamkaew M.D. CM: How many patients do you look after, and do you have foreign patients either in hospital or as out patients? Doctors: There are approximately 700 Thais under our in-patient care at present, with our out-patient facility dealing with between 100 and 200 people every day. Last year we had 155 foreign patients, mainly from the USA, Europe and Australia, of which 38 were admitted for treatment. This year, up until October, there have been 154 foreign patients so far, with 46 being admitted, showing an increase, with 90 foreign patients being between the ages of 31 and 60. CM: If visitors are allowed, do the foreign in- patients receive many visits? Would you welcome expat visitors? Doctors: Visitors are very welcome, under supervision, as many of the in-patients receive few or no visitors. For example, an American dementia patient has been here for one year, and received no visits during the whole time. An English gentleman has just been admitted with severe depression; he desperately needs someone to talk to. If anyone can spare a few hours to visit, they can contact the hospital directly, or Dr. Kittiwan on 081-9500674. Dr. Paritat Silpakit, a director at the Chiang Mai branch of the Samaritans, would also welcome a call on 053-225977/8. Anyone with experience in dealing with the mentally ill would be most welcome, although this is not essential. CM: We believe treatment is a lot cheaper in your hospital than in private hospitals around town – is this correct, and can you give any ideas on costs? Doctors: Treatment at Suan Prung costs a lot less than the private hospitals or clinics. Many of the in-patients at Suan Prung have been referred from private hospitals which do not have appropriate security facilities. Suan Prung is the only hospital in Northern Thailand that is able to accept foreigners with major mental problems. CM: How many doctors in your team speak English and are able to deal with foreign patients in their own language? Doctors: There are three of us who are fluent in English, two of whom deal directly with the patients. Some nurses also speak English. However, we would use interpreters for Japanese, German and French wherever possible. CM: What would you consider the most common mental problems you and your team deal with? Doctors: The most common ailments are bi-polar affective disorder, schizophrenia and alcohol abuse. Of course, many patients suffer from depression. CM: What kind of treatment does the hospital favour, chemical or psychoanalytical? Doctors: We favour both; however, we use mainly drug therapy, due to resource restraints. Also, we find that health insurance companies will pay for drug therapy, but not for therapists. CM: What plans do you have for the future concerning foreign patients? Doctors: We are planning a new building, due to be finished in 2009, in which one of the wards will be international with appropriate English-speaking staff. 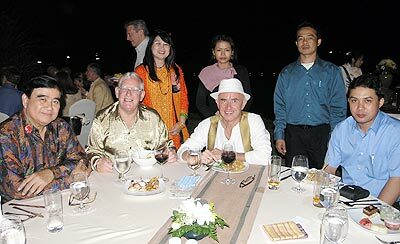 However, those foreigners without money will continue to be treated alongside Thai citizens. We treat foreigners who cannot pay, although this policy does have an effect on our budget. Resources are stretched and we need to raise funds. 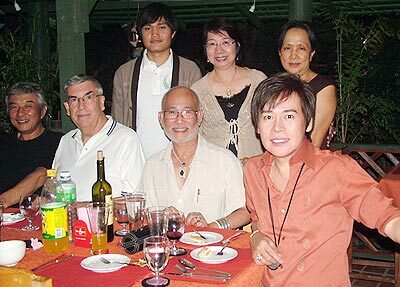 For example, one patient in a private hospital, once his money ran out, was transferred to us at Suan Prung. Also, the Samaritans would like to provide an English service for people who are desperate, but they need foreigners to help with this. Both Paritat and Kittiwan have stated that they need more collaboration and networking with the consular and embassy authorities. CM: What is the procedure, telephone numbers, etc – if someone wishes to make an appointment to receive treatment? Doctors: Those suffering from mental disorders - or someone who cares for them - can contact the hospital direct, or speak to Dr. Kittiwan on 081-950-0674. Alternatively, they can email thiamkaew @gmail.com. Our out-patient clinic is on Thursdays between 9 a.m. and 4 p.m. If people do not want to queue for an appointment they can visit the private clinic. 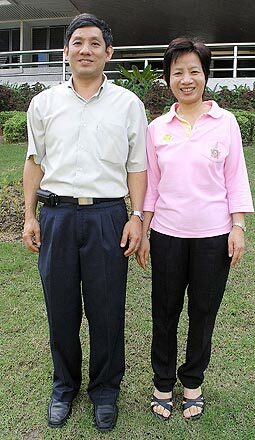 The Chiang Mai Mail would like to thank both Dr. Paritat and Dr. Kittiwan for sparing the time to talk to us. 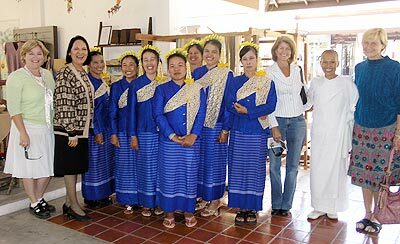 Hope Watcharaprecha (2nd left) is pictured with the ladies from the Women’s Weaving Group of Pa Daeng Village. A group of ladies from Pa Daeng Village, together with their woven products, descended on JJ Markets on December 3 to both present and sell their wares to the public. In 2005, these ladies formed their own Women’s Weaving Group to provide themselves with a steady income. Many of the weavers in the group, which works in the temple at Ban Pa Daeng, are grandmothers who are responsible for their grandchildren’s welfare. Originally there were 5 families in the group, but since its founding it has grown and now encompasses 44 families, all from rural backgrounds. The group’s traditional skills have been acquired working with wild silk (eri silk) and cotton, and they are now linked successfully with the ‘One Tambon, one Product’ (OTOP) marketing system. OTOP stalls can be found in the ‘market’ areas of Tesco and Carrefour supermarkets, as well as in the night market and walking street. The products are well-designed, beautifully made, and sensibly priced. For further details, please visit the village’s website at http://padaengvillage.org/index.html. Even for those if us who don’t hail from the US of A, Thanksgiving Day has its own significance, reminding us to be thankful for the many positive things in our own lives, particularly if those lives are being lived here in Chiang Mai. So, as American residents in the city were settling down to turkey with all the trimmings and home-made apple pie, we were arriving, having been invited by Dr. Lina, at a small but very attractive Filipino restaurant in a soi off Nimmanheaminda Road - to be greeted by turkey with all the trimmings and home-made apple and pumpkin pies. Annie’s beautiful singing accompanies her husband on keyboard to end a perfect evening on Thanksgiving Day. Our small group included Chiang Mai’s own fashion designer and tireless charity supporter, Tananan Willson, along with her friends and Ting, the indispensable General Manager of Hillside 4 Condotel. Before we all tucked in to large quantities of a totally home-made and very delicious traditional Thanksgiving dinner, Dr. Lina introduced us to the owner of the Mabuhay Restaurant, Annie Prathuangsuk, and her husband, an architect with a rare talent for playing the electronic keyboard. Annie is very proud of the fact that her restaurant, established for 25 years now, serves totally authentic Filipino food, all of which she cooks herself, using only the best and freshest ingredients. After the meal we had an unexpected treat. 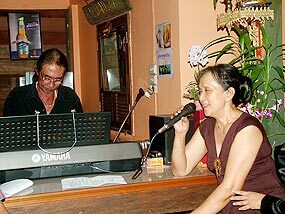 Accompanied by her husband, Annie sang beautifully many songs which we knew and loved, bringing a perfect Thanksgiving evening to a close - the kind of evening which only happens here in Chiang Mai. The Mabuhay Restaurant is located on Soi 2, on the right as you go down Nimmanhaeminda Road towards Suthep Road, tel-053-223-753/089-478-8474.